Hello all! Here is the latest Style Crush post, featuring Florence Welch. I’ve chosen this look as I think it is very typical of her and, me being me, I love all the vintage inspired pieces she wears. This look is probably like Marmite. You will either love it or hate it. I am in the ‘Love’ half of the audience and I think she pulls it off brilliantly. The only thing that I’m not too keen on is her hair. I normally love her red flowing locks, but this to me personally is a little too orange, and the style is very ageing on her. However that’s not we’re here to admire, so onto the outfit! I really like the clashing prints of paisley and vintage check, and the attention to detail. Such as the lace trim of the skirt, the suspender tights and the trilby hat. Everything just seems to work in a weird way. Here is my take on the outfit. I couldn’t find a suitable printed cardigan that I felt resembles Florence’s, so I’ve gone for a simple shrug in a similar shade. 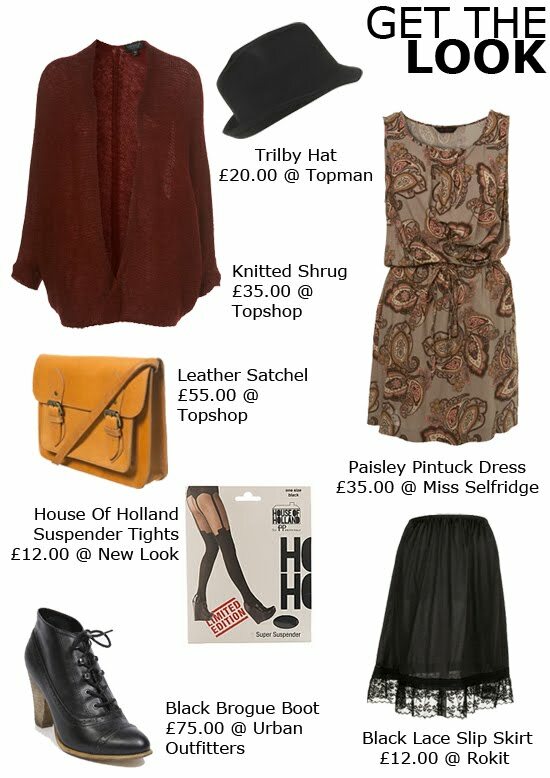 The items pictured were found at Topshop, New Look, Urban Outfitters, Rokit, Miss Selfridge and Topman. What do you think of Florence’s style? I’ll be back tomorrow with some photos from a recent shoot I styled. yay thanks for doing this post i love it! I love this outfit on Florence, she pulls it off like no one else could!